The FC800 EverCool refrigeration hose offers the necessary flexibility to allow for the relative movement between the compressor and hoses when the engine starts and allows for installation in space restrictive applications. It sets itself apart due to its high temperature resistance and extremely low permeation rate. As a result, Daimler EvoBus could increase the lifetime of air conditioning hose assemblies in buses reducing their replacement cost over time. 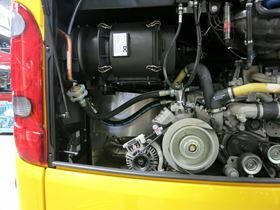 The compressor is powered by the bus engine and is therefore installed in the engine compartment. Rigid lines, generally made from copper or a similar robust material, carry the refrigerant from the roof unit to the compressor and back. The FC800 EverCool core is made of a blended CR Rubber material, a synthetic characterised by its long-lasting elasticity, heat resistance and excellent resistance to a number of refrigerants and compressor oils. This core tube provides significantly greater flexibility than a corrugated hose and therefore allows for the relative movement. Eaton has launched its VSQ (Vane-Speed-Quiet) pump series designed to provide operators with a minimum speed range of 0-50 RPM to decrease energy usage.